'Unnachgiebiges aggressiv bekampfen, ist kampf gegen sich selbst' is a phrase owners of the first Gila album will remember well! The group was formed in Stuttgart in 1969, and was busy working with different media using film, slide show, poems and music. Their highly ambitious first album appeared August 1971, recorded by Dieter Dierks during a week's intensive work that Summer. The concept of the album was to reflect the group's (self-declared) progression from aggression to communication during their two-year lifetime. The continuous music was mainly instrumental, dominated by the leader Conny Veit's excellent and imaginative guitar play. They created a Floyd-like space rock bursting into heavy climaxes. In addition the album had a most beautiful psychedelic painting on its fold-out cover. This is one of the best German albums of all time! Some months later, the group regrettably disbanded and Veit became a member of Popol Vuh. A new aspect of his guitar abilities was heard on Hosianna Mantra, adopting an almost meditative style. Popol Vuh was (almost) exclusively a studio project, so Conny Veit felt the desire for a live outfit. 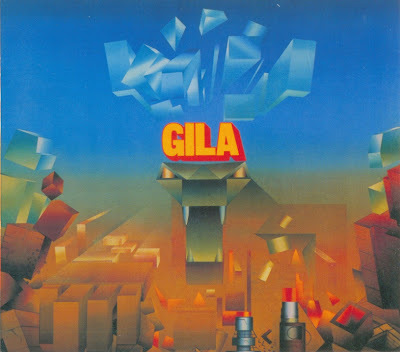 For this reason Conny Veit put new life into Gila. The Bury My Heart At Wounded Knee album (recorded at Dierks Studio, Stommeln 1973) was almost a Popol Vuh album, except that Conny Veit's compositions replaced Florian Fricke's. This was a concept album, dealing with one of the last and worst massacres of native Americans. The acid touches of the first album were now replaced by a pleasant folky and more acoustic mood, characterised by 12 string guitars, grand piano and Fichelscher's special drum style. "This Morning" and "In A Sacred Manner" were songs of celestial beauty with dreamy vocal harmonies and lush arrangements. The album's conclusion "The Buffalo Are Coming" was a more dramatic piece with its thundering percussion. This is another essential album! When Gila's activities came to a halt in 1974, Conny Veit joined Guru Guru for a short while. Eastern mysticism, acoustic psych folk, electronic effects and heavy blues riffage are dramatically fused in this melting pot of cosmic Floydian space rock.